The other day, Nurse Angry was about to climb on her trusty bike after a particularly unentertaining evening shift. The boredom of routine tasks and repeated patient toilet visits made time go slowly, and recognizing a friend’s 95-year old granny in bad shape wasn’t such a fun thing either. But wait, something new happened- someone had put a sticker on her bike! 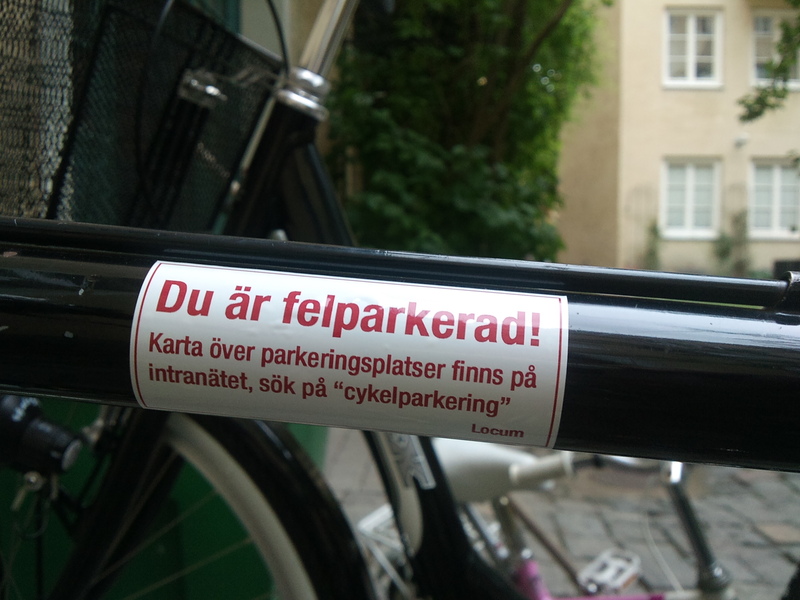 For those who can’t read Swedish, it says: You are parked incorrectly! A map of parking places can be found on the intranet, do a search for “bicycle parking”. Locum is the name of the landlord. Kind of cute, really. In New York they would probably just have thrown all the bikes into a dumpster and emptied it into the East River. Nurse Angry has to admit that there were rather a lot of bicycles parked on the grass outside one of the back doors. But why is it that there are too few or no bicycle stands at the strategic locations where people actually want to leave their bikes? Nurse Angry can promise you one thing: stickers are not nearly threatening enough to get us to move our bikes. Locum, those of us working in healthcare who daily brave the road rage of Stockholm not to mention the insanity of the ER- we laugh at your stickers. We go to work 10 minutes early and leave 10 minutes late, unpaid, to change our clothes, we are NOT parking our bikes 2 feet further away than we have to. Look INSIDE the hospital. A bunch of dirty old bikes on the lawn is much less of an eyesore than what can be seen at every twist and turn inside. It’s a disgrace. For example, how hard can it be to have a functioning toilet seat for the patients? Nurse Angry is often embarrassed by the state of things and is tempted to photograph all that’s unsightly and send it to Locum with the message: Start here instead of harassing overworked, underpaid bicycle-borne healthcare workers. Nu blir jag så upprörd att jag måste skriva på svenska … Gör det! Fotografera alla trasiga, otillräckliga, illa fungerande, gamla, snålanskaffade grejer och alla hopplösa miljöer i Locums lokaler och visa upp dem en efter en i närbild. Eller varför inte beställa en rulle klistermärken med texten “Renoveringsobjekt” eller liknande och plåta missförhållandena med dessa pigga stickers. Morr! Jag stödjer din kampanj om du drar igång den, Nurse Angry. Visst blir man sur. Stick your stickers where the sun don’t shine, Locum. Snart börjar Nurse Angry sitt korståg. Beräknas vara klart typ 2025. För kännedom: Nurse Angry låter klistermärket på cykeln sitta kvar så att den är felparkerad oavsett var hon ställer den.